Talking about "the machine behind the field humanitarian work", in my previous post. 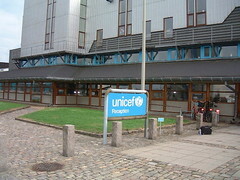 Two weeks ago, I flew to Copenhagen to visit the large Unicef base there, their main logistics and procurement support centre. It was a different setting from our logistics base in Brindisi.. And I am not just talking about the weather (which was cold and rainy, compared to the 40 degrees in Brindisi!). These were purpose-built offices and warehouses. The offices were really nice, with a lot of wood, light and plants. Those Scandinavians sure have an appealing style in interior decorations. 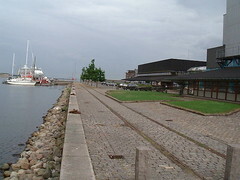 The similarity was there though, as their offices and warehouses are located in the harbour area. (Is it not a dream to have an office looking over the water and the sailboats?). 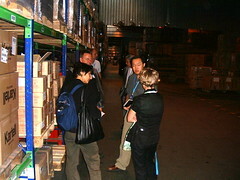 Apart from the office complex, they have huge warehouses, and that was where our main purpose of our mission was: to learn of how they organise their stocks, the systems they use to manage the warehouses... All part of finding a way to work closely with them, learning from their experience, and share resources. 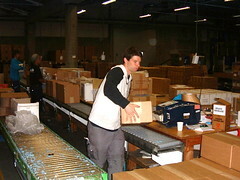 Streamlining can only benefit both of our organisations, and our common work in the field!